If you are a starting a vegetable garden for the first-time, you've come to the right place. The information here comes from lots of experience, and can help you avoid the most common mistakes that beginners make. Follow the Seven Steps to Starting a Vegetable Garden below, and you will grow a beautiful vegetable garden - no matter how big or small your space - your very first year. Vegetable gardening is a great way to help the earth and support your health at the same time. But I won't kid you - it takes some work and investment the first year. But the rewards are so worth it! Once you start caring for little plants, watching them grow, knowing that they are going to provide you and your family with the healthiest, tastiest food possible... you'll be hooked. So jump in! The seven steps below walk you through starting a vegetable garden. It may also be helpful to check out the Vegetable Gardening Tips article, which will steer you away from some common mistakes. Don't skip this step! Starting a vegetable garden begins indoors, with a piece of paper and a pencil. (There are fancy programs out there to help you make a beautiful plan, but truthfully you don't need them.) Think about your outdoor space, and choose an area that gets at least 8 hours of full sun a day. You can do a fancy vegetable garden layout like circle beds or raised beds (which are very popular), but for your first year I would recommend starting simply. If you have only a patio or balcony, then container vegetable gardening is for you! Some plants need full sun all day, and some tolerate a little shade. 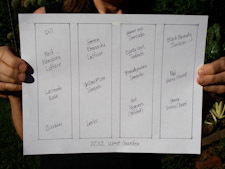 Look at the chart in the vegetable garden layout article that shows which is which, and draw your plan accordingly. Narrow row gardening has pretty much become a thing of the past , because wide beds are a much more efficient use of space. Draw out on paper where your bed(s) will go, with each bed being 3 or 4 feet wide so you can reach to the middle without stepping on the bed. If you're making more than one bed, give yourself an 18 inch wide path in between for walking and wheelbarrow access. And a serious suggestion: start small - you'll be much more satisfied with a small garden that is well cared-for and weeded, than a big tilled plot full of weeds in August. Expand or do fancy shaped beds next year. Keep it simple at first. Now decide what you want to grow. 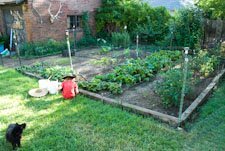 When starting a vegetable garden for the first time, grow only what you love to eat, and focus on crops that are more expensive to buy from the store, like tomatoes, peppers, basil, lettuces, green beans and Swiss chard. Onions and potatoes are relatively cheap to buy, so don’t use up garden space on them your first year. Grow them when you have some experience and want to expand your garden. Also, if you want to grow corn, know that it takes a lot of space because it needs a pretty big patch, maybe 10' square, to get sufficient pollination for good, full ears. Next you need to figure out your average last frost date, which you can get from your local State Extension Service website, or a good local nursery. This is very important because you must know when it is safe to plant seeds or seedlings in your area. You don't want to lose your new seedlings to frost. The last thing you need to decide is whether you will be starting a vegetable garden from seed, or from seedlings purchased from a nursery or garden center. I usually do both: I start most things from seeds started ahead of time in seed flats, but I also buy a few nice big tomato plants to put in after the last frost date. Seed packets will tell you how many weeks ahead to start seeds indoors in seed flats, if you want to get a jump on the season. And... if you want to keep your vegetable garden producing past the frost date in the fall, read the Fall Gardening and Building a Hoop Tunnel articles so that you can plant at the right time. 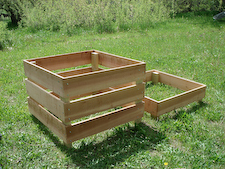 Now it's time to decide if you want to build a wood-framed raised bed vegetable garden, or just grow vegetables the good ol' way, in the soil. Personally I'm not a fan of framed raised beds, because they can be quiet expensive up front and must be filled with potting mix or else they will pack down into concrete (more expense). They bypass natural soil ecology, and are not at all "green" in terms of resource use. However, they can also be really beautiful and are hugely popular, so if you decide to build one, check out the Square Foot gardening and raised bed vegetable garden articles. If you’re going to plant in the earth, soil preparation is usually the hardest part of starting a vegetable garden. A lot of people buy or rent a rototiller for the job, but rototilling actually creates a hardpan below the depth of the tiller, and it destroys soil structure. However, many people like rototillers because they are relatively fast. So I say, better to use a tiller than not to garden at all! I prefer to garden in French intensive, double-dug raised beds. I dig my garden space up by hand with a good garden spade and digging fork, incorporating lots of homemade compost at the same time. Every couple of years I “double-dig” the bed down about 18 inches deep while incorporating more compost. In the alternate years I use a broadfork to aerate and loosen the soil, which goes faster than double-digging. But whichever method you choose, make sure your ground has a little moisture in it before you try to dig it up, especially if it is currently lawn or an area that has had a lot of foot traffic. If it is baked, dry or full of weeds, begin by watering your space deeply about 24 to 36 hours before digging. Don't till in weeds, especially quackgrass or orchard grass, but rather fork them out. Every bit of broken root left behind will sprout a new chunk of grass. If you're starting a vegetable garden for the first time, chances are you don't have any homemade compost yet, so you will have to go buy some to amend your soil. As you are forking and spading up your garden soil (or rototilling it), mix in as much compost as you can afford. This will work wonders for keeping your soil loose and friable, keeping the soil ecology healthy, and therefore keeping your plants and you healthy! Once your garden bed or beds are loosened, weeded, and amended with compost, you are ready to plant. If you are planting seeds, pay close attention to the recommended seed depth and seed spacing on the packet. If you are planting seedlings from the nursery, the plant tag should have recommended plant spacing printed on it. Here's a big mistake to avoid when starting a vegetable garden for the first time: planting those teeny plants closer together because you have so much empty ground to fill. That tiny tomato start may get to be 4 feet across and 6 feet high by August, so give it the recommended space that it needs. Proper plant spacing will also make it easier to access at harvest time. Plant your tallest crops toward the north side of the garden so that they don't shade smaller crops (the south side if you live in the Southern hemisphere). Put tomato cages over your tomato plants while they're still fairly small, and help them grow up into the cages so they receive good support when they start to bear big, heavy tomatoes. See the article on growing tomatoes for recommendations on making your own tomato cages that are much sturdier than the hardware-store kind. Be careful here! If your garden is not on automatic watering, be sure to keep a close eye on it, especially at first. Use a good, heavy-duty oscillating sprinkler, and make sure you don’t let your newly planted garden get dry. Water in the evening when it is cool, to avoid plant diseases like powdery mildew or early blight. If a seed swells and starts to sprout, but then dries out, it will die. When first starting a vegetable garden, this is a critical thing to watch, or else you can lose a lot of work. One of my local farmer friends lost a huge crop of carefully, hand-transplanted lettuces last year because her crew didn't water deeply enough the next day. Weeds are much easier to deal with when they are very little. My new favorite tool for this job is a little Japanese weeding sickle (called a nijiri kama) that you pull toward you about a quarter inch underneath the soil surface to cleanly cut off the weeds at the root. But if you catch weeds when they're little enough, any sort of scuffing up the surface of the soil will knock the little weeds down. Make sure you don't inadvertently weed out your crop plants! Wait until your seedlings are big enough to clearly discern from the weeds before you start weeding. Make weeding a twice a week meditation (I do it a bit daily), rather than a half-day weekend chore. This routine also helps you make a relationship with your garden. Starting a vegetable garden is easy, but truly making a relationship with it takes time, a certain slowing-down and, well,noticing. You’ll just have to take my word for this, but when it happens for you, you'll understand what I mean. I have found that plant pest problems are, unfortunately, usually worse when you are first starting a vegetable garden than after one has been established for awhile. This is because the soil is usually not yet very rich and healthy as will be after a few years of love and compost, and therefore the plants are more vulnerable. After a few years of being fed wholesome homemade compost, your soil ecology will be thriving, and your plants will be strong and healthy, and not as attractive to plant pests. Watch carefully, especially when your plants are little, for signs of insect damage: little holes chewed in the leaves, tiny black bugs crawling around, etc. (Those would be flea beetles, see the plant pests article.) Use a natural insecticide such as soap spray (recipe in the plant pests article) or neem oil if necessary, but work on building up your soil health and overall garden health by planting small-headed flowers around to attract beneficial insects, confusing plant pests by mixing different crops in one bed (like spinach and lettuce, or tomatoes and carrots), and learning to make compost and using lots of it. Beginners usually discount this step, but it is most important! 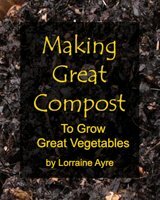 Growing vegetables is only half of an equation - "growing" compost for your soil is the other half. Vegetables take nutrients out of the soil, and composting puts nutrients back in. Don't rely on chemical fertilizers to do the job. Using chemical fertilizers without compost is a bit like eating only donuts, and then taking vitamins to fool yourself into thinking that you're getting what your body needs. You may get your daily allowance of vitamin C, but you won't be healthy. For a simple compost operation you can start a pile of kitchen scraps in the corner of your yard, mixed with some fall leaves, grass clippings and coffee grounds from your local bistro. But it will be more attractive and efficient if you use a compost bin, provided you turn it once in awhile to aerate it. You can build your own homemade compost bin or buy a black plastic one, but whichever way you choose, start making food for your garden now. With tomatoes, it's a waiting game. They need lots of heat, so it's usually July or August before you start seeing red tomatoes. But then, watch out! All of a sudden you'll have more than you can eat, and so you'll have to share with your neighbors. And believe it or not, those little red plastic thingies that you put around the base of the plants really do speed ripening. So, that's the basics. Starting a vegetable garden is one of the best things you can do for yourself! (IMHO). And for more information on any specific topic, check out the many articles listed on the left. Many of them branch out into more detailed information. Amen to that. Blessings on your adventure.